Still working on Fun Folds for my team challenge, and came across someone doing a flip flop, but it wasn't a card, more of a tag as it didn't have an inside like a card. So I set my mind to make my own template. 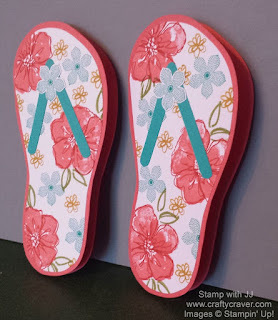 I knew I didn't want the left side to be straight and I definitely wanted it shaped like a flip flop. The challenge was making sure I had enough overlap on my template to create the card fold, but still small enough that it didn't look flat once I folded the card. 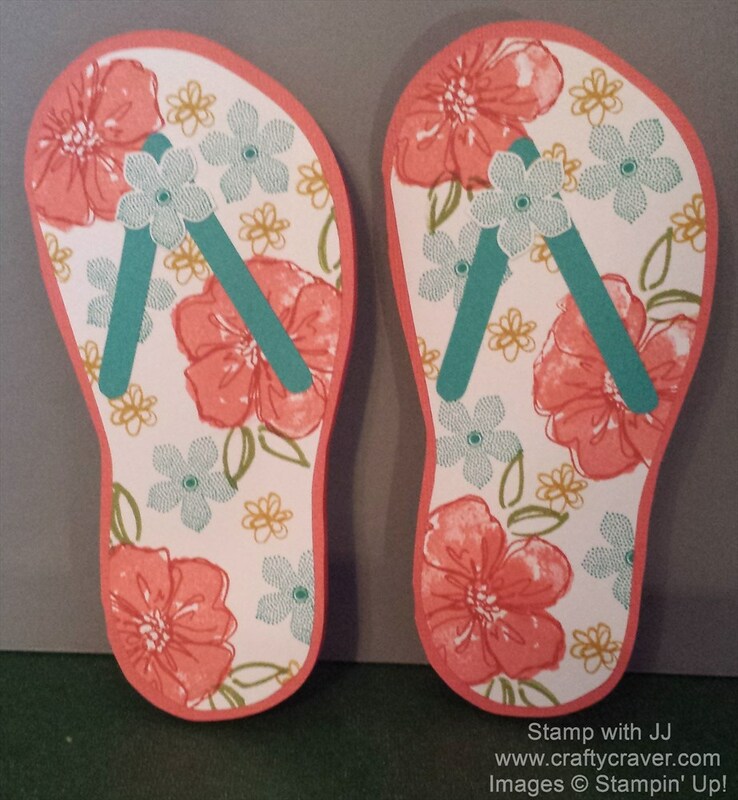 I drew a normal looking flip flop, then mirror imaged the shoe to the left, overlapped the shoe slightly, then cut out the outline, and using an Exact-o knife I cut out the center of the card (where the foot instep would be). I made my own DSP using my stamps from the stamp set Penned and Painted, used a flower from Botanical Builder Framelits, put on a little jewel on the flower, and BAM! I had my flip flop card. I was SOOOOO excited that I had pulled it off. But something was missing. 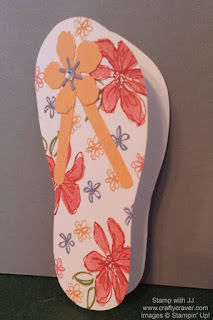 After looking at it for a couple of days, I still loved my flip flop card, but I decided there were a couple of improvements I could make so it would POP more. First, I gave it a background, a solid color to make the home made DSP stand out. I had the room, so I increased the base slightly (it still fits into an A2 envelop) and made another template for the top of the base and turned that into the DSP. Second change was to have the top of the flip flop (the inverted "V") a more contrasting color and third change was to make the flower smaller (still undecided about that one). And BAM, I had my improved flip flop shoe. I don't know if this really qualifies as a Fun Fold card, but I sure had fun make it. I'm sure I'll make more of them. 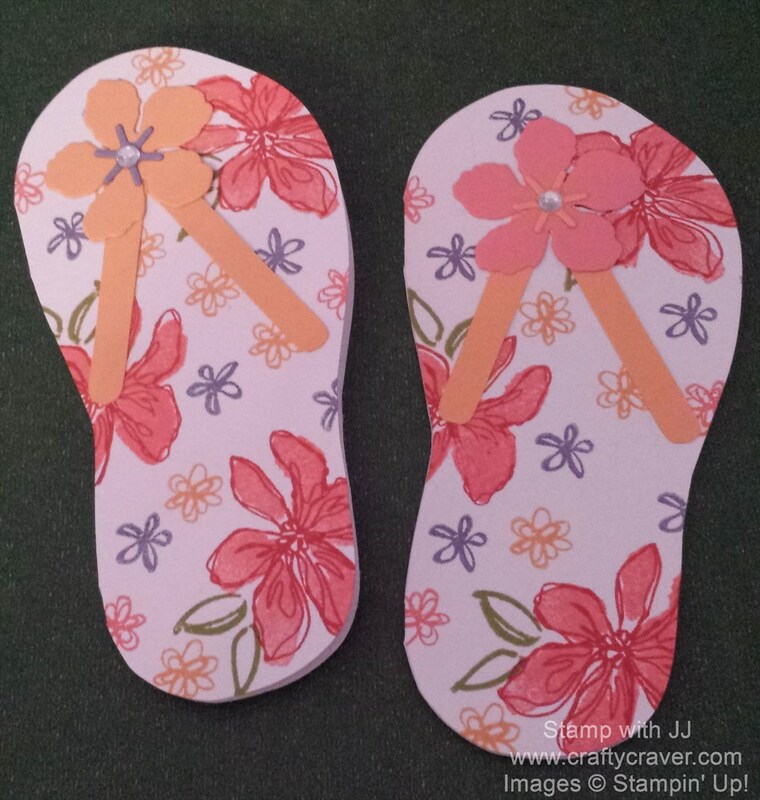 Maybe I'll work on making it a full pair of flip flops? 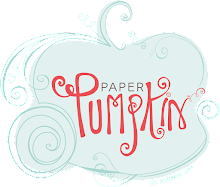 Hmmm, the ideas are churning!